REGISTRATION scene finds Bob Minshall, Sue Pakis, Adele Mitchell, Steadham Acker and Waldo Waterman at the central desk. Brings out oldtimers for annual event. Forty-seven years ago, the last weekend of August, the Wright Brothers were packing up for Kitty Hawk to begin that series of glider trials which ended in the powered flights of 1903. With them was a tail-less glider with warping wings, constructed after a year of intensified study. Though the hours of expected practice in the air dwindled to minutes, new figures were obtained on the life and drag of a full-scale machine, and four years later the world's greatest invention was achieved. With reduction to commerce, some hundreds of other pioneers flew, invented and improved and organized and flew for another twenty years until their dwindling number brought them together that spirit suggested by our late friend, Albert Lambert. For another nineteen years now, the EBs, gradually increased on the discovery of others, have been holding communion here and there where a few or more could have gathered together, and national at the air races, long since adopted as the place and date of the annual migration. 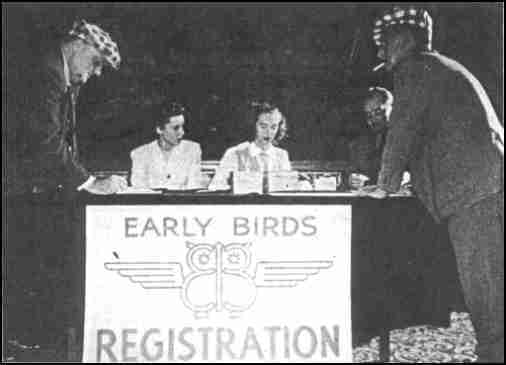 This year, on the nineteenth anniversary of the Early Bird organization, its membership took occasion to remind itself of that date in 1900 when the two young bicycle makers of Dayton undertook to prove wrong certain prophets of the impossible, inaugurating an era of which these followers of the Wrights found outlet for their more or less famous activities. One More Year Again, as annually, in 1947 the EBs got together---a goodly number in person and more in wish and spirit---at the Cleveland Air Races for a three-day round of cativity, August 30-September 1. As usual the Bob Minshall Reunion Committee thought of about everything. And there was President Scragg to support the program with his special facilitie even as he had in previous years. The combination produced hotel headquarters, reservations, raffle tickets, access to the restricted space at the races, bus transportation to and from the airport, and a strip ticket covering all the other events. This year the races covered three days instead of four, but nevertheless the clan started to gather on Friday night to rub shoulders and enjoy the traditional EB fellowship. Then, on Saturday the hardy ones went out to the races---rainy and stormy weather keeping the general attendance low. The bus stood by all thgough the day, and our group got off getter than most because of the bus facilities. Al Engel deserves credit for the excellent transportation arrangements. Saturday night presented the best opportunity for the banquet and was chosen for that event because Sunday was inappropriate and Monday would start the exodus. On future occasions it will probably be necessary to continue having the banquet before the business meeting, although it would be nice to be able to introduce the new officers at the banquet. Our president, George H. Scragg, acted as master of ceremonies and limited his remarks to a recollection of early aviation history, so significant to EBs and the progress which has been made. He touched upon the first Wright flights and the developments which they inspired. President Scragg introduced Fred Crawford, president of the Air Races, who made his only fomal talk of the air race period to the EBs. In a light vein he covered the contribution of the EBs to aviation and reviewed the growth over the past three decades. As might be known, Crawford conducts a museum of antique automobiles and in the collection has now included a few selected pieces of aviation. These are primarily engines, propelleres, and parts, but he does have the restored original Curtiss pusher of our own Al Engle, and another early plane. Stepping out of the past, after his salute to EBs for their contribution, Brigadier General Leon Johnson, speaker of the evening, discussed the present status of the USAF and the effect of aviation on the new plans for national defense, trying the three great arms of the military for more coordinated effort. Brigadier General Johnson came to us by special assignment of the War Department. He is the officer who risked his life beyond the call of duty in carrying out the daring Ploesti oil fields raid, and who distinguished himself throughout the European campaigns. He is one of the few army generals to win the Congressional Medal of Honor. In addition, he has been awarded the Silver Star, the Legion of Merit, the Distinguished Flying Cross both of this country and Great Britain, the Air Medal, the French Legion d'Honneur and Croix de Guerre, and the Belgium Croix de Guerre. Frank Tichenor, our banquet host, was not present, unfortunately, owing to illness---not serious, but taking a rest under doctor's orders. Since then he is back on the job, his old fighting self again. After a good night's sleep, the annual meeting was called the following morning at Hotel Carter, at which time elections were held and business taken up. Election of Officers For the past few years no nominating committe has been appointed in advance and approved by the trustees as provided by the by-laws, and as a result the monimation have been made from the floor. This year a committee was appointed but not in sufficient time to be approved by the trustees, and as they were located in different parts of the country they did not have an opportunity to get together until they arrived in Cleveland. The committee, headed up by Waldo Waterman, and including Hugh Watson, Augustus Post, Brig. Gen. F. P. Lahm, O. H. Snyder, and Wm. A. Denehie, presented a ticket and in addition called for further nominations from the floor. The ticket was voted as presented, there being no other nominations except R. S. Knowlson for third vice president. Treasurer Post reported a balance on hand of $1806.10, with many dues umpaid, the income for the past year being less than dues received, even at the $2 bargain rate. It was porposed that membership cards be not sent to delinquents---but the sense of all EB meetings is that once an EB, always an EB. Following the established procedure, certificates were prepared and mailed to the President and Secretary for their signatures. The names of two additional applications---Erik Heldesheim and John B. Daniell were held up for further consideration. A brief description pertaining to proof of solo of each accepted applicant will be mailed to the Board of Governors for their approval. On due motion, those present vociferouosly voted the appreciation and thanks of the organization to Frank A. Tichenor for his aid and support over these many years. Time for the air race bus approaching, the Secretary was able merely to mention that his report would ask for advice on the publication of a list of members alphabetically, to discuss the possibility of additional members from among known eligibles, and to recite the history of the proposed metal membership card, past efforts and proposals on plaques and memorials, the trophy or other recognition of outstanding efforst, biographies of the EBs, pilgrimages, a national fund, and the museum project on which definite action might at some time be taken.